Judging Panel: Website, Media and Communications Committee. Deadline Dates for Prizes: 31st May and 31st October. Images: Should be a single colourful graphical image as a JPEG or TIF file with a minimum resolution of 300dpi and a maximum size of 3Mb, for use on our website/newsletter or other media. We will also accept colourful images of anatomical artwork. Please confirm that you have obtained permission from the people in any images that you send to us that they are content for their images to be used on the Anatomical Society website/newsletter or other media. By submitting an image you are confirming that you have obtained permission from the people in any photos that you send to us that they are content for their photos to be used on the Anatomical Society website/newsletter and other media. Narrative: A short narrative should accompany the image (50 words - similar to a figure legend). For example: what it is; how it was produced; why it is special and so forth. Number of images: An applicant may submit not more than 3 images for any one competition. Copyright: Applicants submitting images must either own the copyright of the image or have gained the explicit permission of the copyright holder for the image to be submitted for this award. By submitting an image (s) Applicants are confirming that either he/she own(s) the copyright of the image or have gained the explicit permission of the copyright holder for the image to be submitted for this award and to be used on the Anatomical Society website/newsletter and other media. 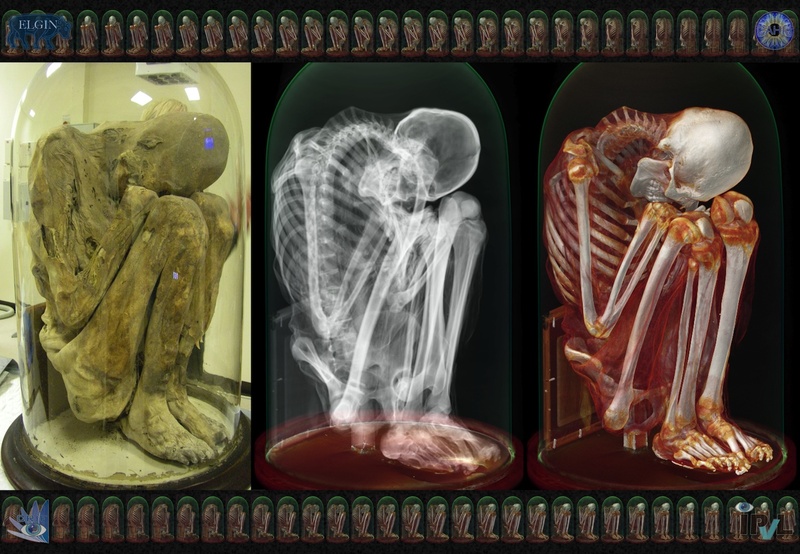 To download and print the poster for the Anatomical society Best Image Prize, please click here. The lead submitting author must be a member of the Anatomical Society who has been elected to membership by Council by the submission date of the award and is up-to-date with their subscriptions to the Society. £ 200 is awarded twice a year. A 3D-model of one of the best-preserved skulls of the gigantic extinct Sicilian dormouse, Leithia melitensis, is created using photogrammetry. The missing cranial features, including the nasal bone, the incisors and the zygomatic arch, are reconstructed using a warped microCT of a smaller but closely related extant dormouse Eliomys quercinus from Sicily. A mouse pyramidal neuron marked by expression of tomato-DsRed. The neurons, detectedfollowingan elegant lineagetracing paradigm,reside in LayersII/III amongst existing cortical neurons, marked by NeuN immunolabelling, and Hoescht to detect nuclei. Imaged as a Z stack with a Zeiss Axiogimager M2 withapotome attachment. Micro-CT image of the nasal cavity of a bearded seal, showing a superimposed section of its extraordinarily complex maxilloturbinate bones. Owing to inevitably limited scan resolution, isolating the extremely thin turbinates as evenly as this, across the whole cavity, required considerable image processing and manual work. Description: This mouse retinal wholemount was reconstructed using a Zeiss AxioImager with Apotome mode. Large alpha ganglion cells were labelled with the antibody SMI-32 (cyan to white). 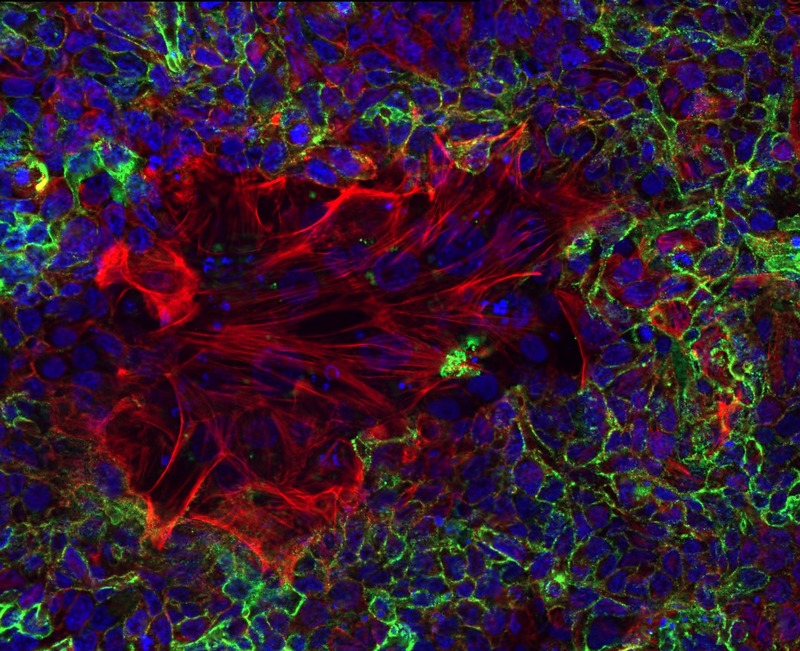 This antibody is raised against mouse, and therefore it labels blood vessels as well. Hoechst was used to label all cell bodies (DNA) (red). Lead Submitting Author: Prof Evelyne Sernagor, Institute of Neuroscience, Newcastle University. Other Submitting Author (s):Dr Gerrit Hilgen and Ms Viktoriia Kartysh, Institute of Neuroscience, Newcastle University. Submitted on: 31 May 2018. Description: The image depicts a Sagittal section of a murine cerebellum cultured ex-vivo for 10 days. Myelin (Green) is shown decorating the Arbor Vitae of the Cerebellum where Oligodendrocytes (Red) are located. Oligodendrocytes produce myelin throughout life. Image was obtained by collating a series of photomicrographs using a Zeiss LSM710 confocal microscope (Zeiss, Germany) and Plan-NEOFLUAR 5 objectives. Images were collated and postprocessed using ZenLite suite 2012 (Zeiss) and Adobe Photoshop 2017 (Adobe). Lead Submitting Author(s): Dr Francesca Pieropan and Dr Andrea D Rivera, Institute of Biological and Biomedical Sciences, University of Portsmouth, UK. 5-day-old zebrafish larva stained with DAPI to label nuclei (blue), phalloidin to visualize F-actin (green) and Myosin7a to stain mechanosensory hair cells (red). Zebrafish sense water motion through hair cells (red) in neuromasts in the lateral line along the body and all over the head. P8 mouse cochlea stained with DAPI to label cell nuclei (blue), phalloidin (green) to visualize F-actin and Myosin7a (red) to stain mechanosensory hair cells. Mammals detect sounds through an array of sensory receptors called hair cells (red) characterized by stereocilia (green) on their apical surface. This is a preserved tuatara that has been imaged using X-ray microtomography. In addition to the skeleton, scleral ossicles, tiny sesamoid bones, and eggs within the abdomen can be seen. This was one of several rare and historically valuable tuatara specimens to be scanned and made freely available athttps://osf.io/bds35/. The image depicts Myelin (Cyan) and Oligodendrocytes Precursor Cells (OPCs, Red) jn Corpus Callosum of a mouse brain aged Postnatal day (P) 8. Images were captured using a Zeiss LSM710 confocal microscope (Zeiss, Germany) and Plan-NEOFLUAR 20 objectives with a numerical aperture of 0.50. 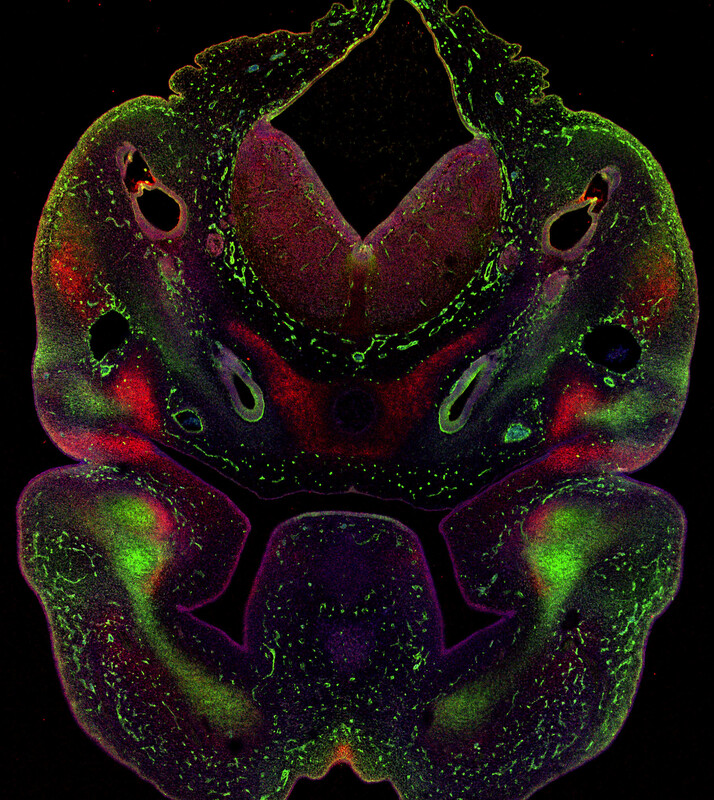 Description:Sagittal section of 8 post-conception week human early fetal brain (obtained fromwww.hdbr.org) stained by double label immunofluorescence for the cell division marker KI67 (green) andthe transcription factor COUPTFII (red). The combination highlights (yellow) regionalisation of COUPTFII-expressing dividing cells to the caudal ganglionic eminence. 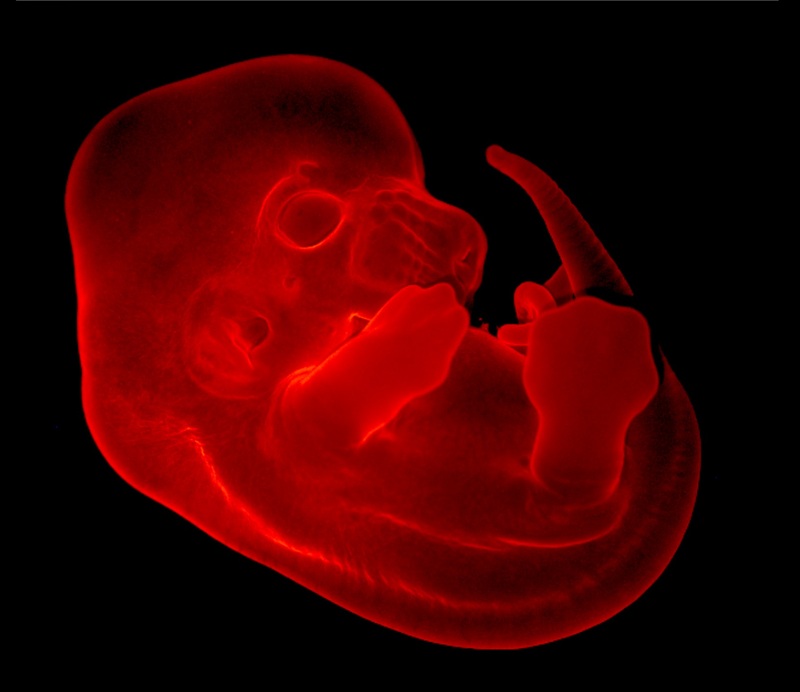 3D anatomy of an embryonic day (E) 16.5 mouse forelimb produced by optical projection tomography (OPT). 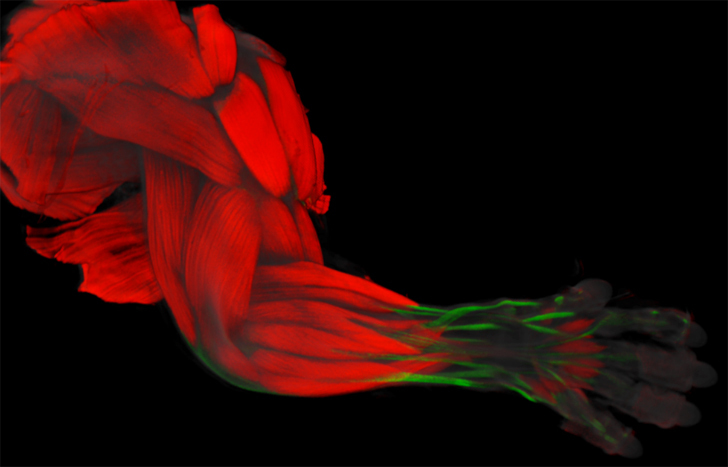 The merged image shows muscle (red) stained with an antibody against muscle myosin (My32). Tendons (green) are labelled using a ScxGFP reporter. Autofluorescence (grey) provides an outline of all limb structures. 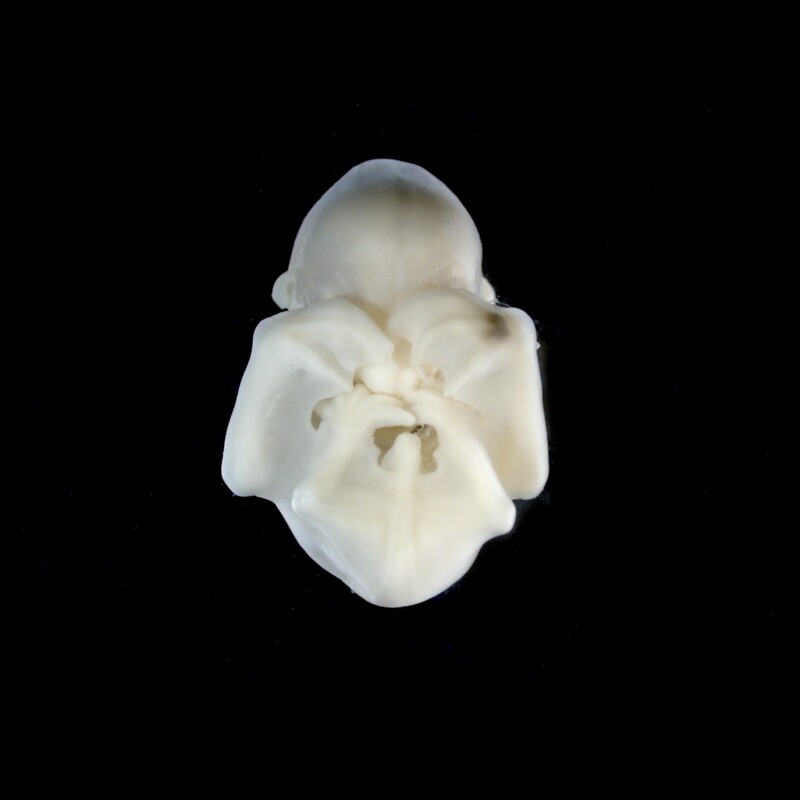 This is an Old World fruit bat embryo collected in 1972 at Ife University, Nigeria. The specimen has recently been processed for histological sectioning to investigate the process of tooth replacement, showing an example of archival tissue being used in modern day science. Image obtained with a Leica MZFLIII stereoscope. Description: A frontal section of an embryonic day 6 chicken head, showing the inner and middle ear, 2nd pharyngeal arches and tongue. Peanut Agglutinin Lectin (red), Sambucus nigra (green) and Wheat Germ Agglutinin (purple) fluorescently label neural tube, cartilage matrix, endothelial cells and epithelia. Lectin staining differentiates between cartilage elements. Description: Fluorescent image of an advanced in vitro mouse embryo attachment site exhibiting embryo outgrowth into human endometrial Ishikawa cells to detect OPN receptor, CD44, in green.Endometrial CD44 plays a role in embryo attachment and its localisation remains unchanged at embryo invasion site.Blue: Cell nuclei staining. Red: Actin cytoskeleton. 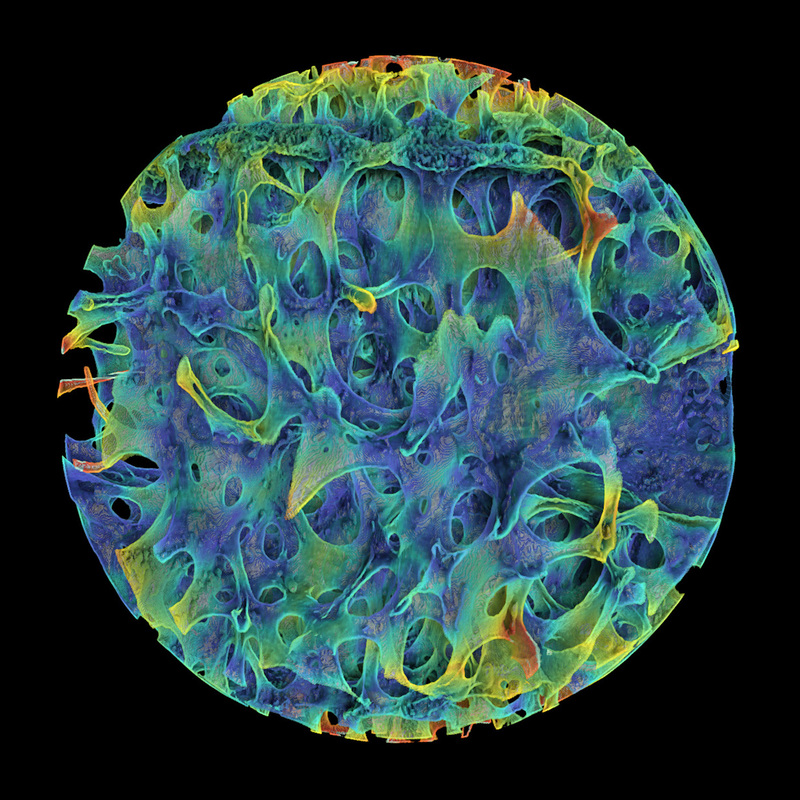 Description: A sphere digitally cut from a 2.5-year old human L1 vertebral centrum and coloured to highlight variation in trabecular thickness. It was created from microCT data using VGStudio and Drishti, for an ongoing project comparing the ontogeny of vertebral trabeculae in modern humans and Neanderthals. Description: A sucker of Octopus vulgaris analysed by scanning electron microscopy (SEM) was captured shedding its skin. A Cambridge Stereoscan360 (Image Access, V.3) was used for acquisition; Adobe Photoshop for pseudocolouring (sucker, green; shedding skin, yellow). This micrograph of the normal shedding process reveals the sophisticated nature of the octopus skin’s interdigitations (comparable to rete ridges in human epidermis). 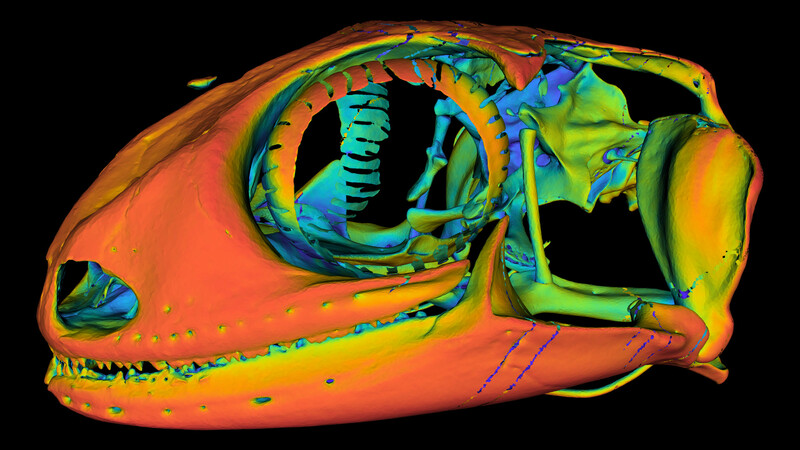 Description: 3D rendering of a gecko skull (Nephrurus levis) from micro-computed tomography (21 um/voxel). Colour corresponds to ambient occlusion (i.e. red surfaces are most visible, blue surfaces least visible). Steep colour gradients highlight foramina. Hidden structures (e.g. bony labyrinth, nasal cavity) can be extracted automatically based on their high occlusion. about the gender, age, condition and other aspects of the person prior to her death. Description: Image shows the morphology of rodent spinal astrocytes, which play an important role in numerous functions in the central nervous system. 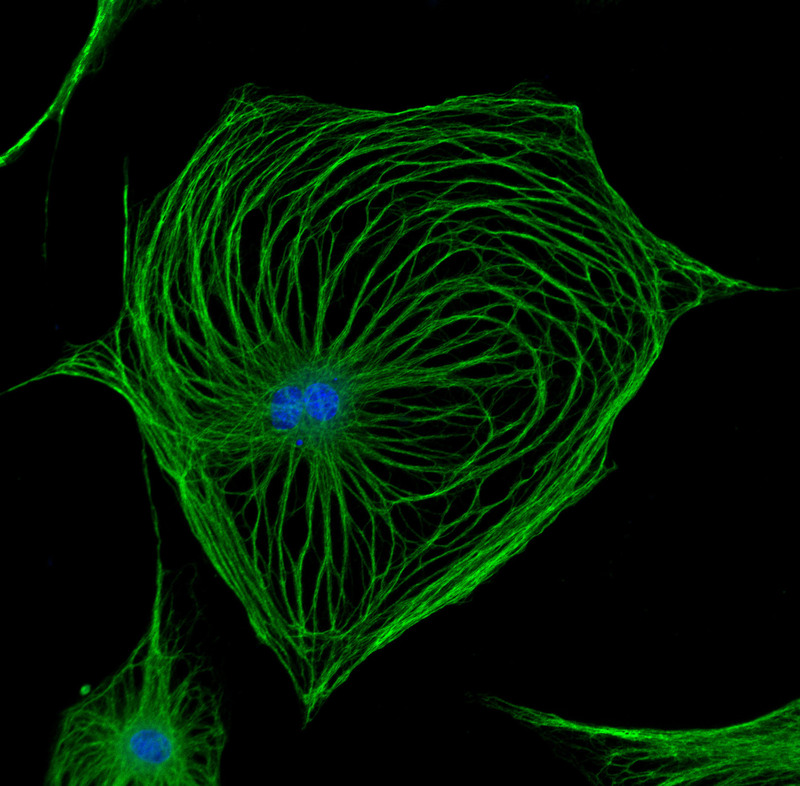 Vimentin (green) demarcates the cytoskeletal structure, illustrating the extensive processes of these cells and dapi (blue) shows the nucleus. 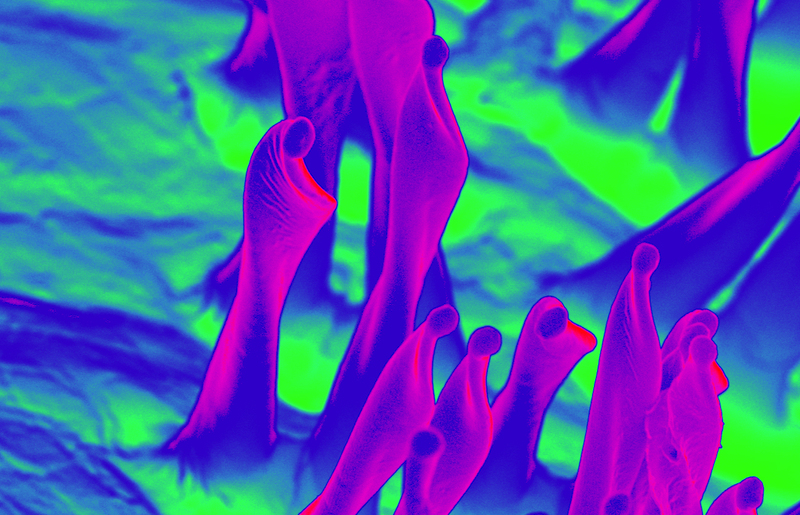 The image was captured using a Zeiss LSM710 Confocal microscope. Description: Mouse embryo at embryonic stage E12.5 labeled with DiI, a plasma membrane marker which was incorporated in the entire epithelial surface. By tracing cell movements, key roles of tissue interactions in many aspects of embryonic morphogenesis can be investigated, contributing to the developmental biology knowledge. Description: Enteric neurospheres, generated from Wnt-1Cre;R26YFP mouse gut. Wnt-1 positive neural crest cells express YFP (green). The neurospheres are stained with dapi (blue) and immunolabelled with (from top to bottom in red) p75, TuJ1, GFAP, and Sox10. 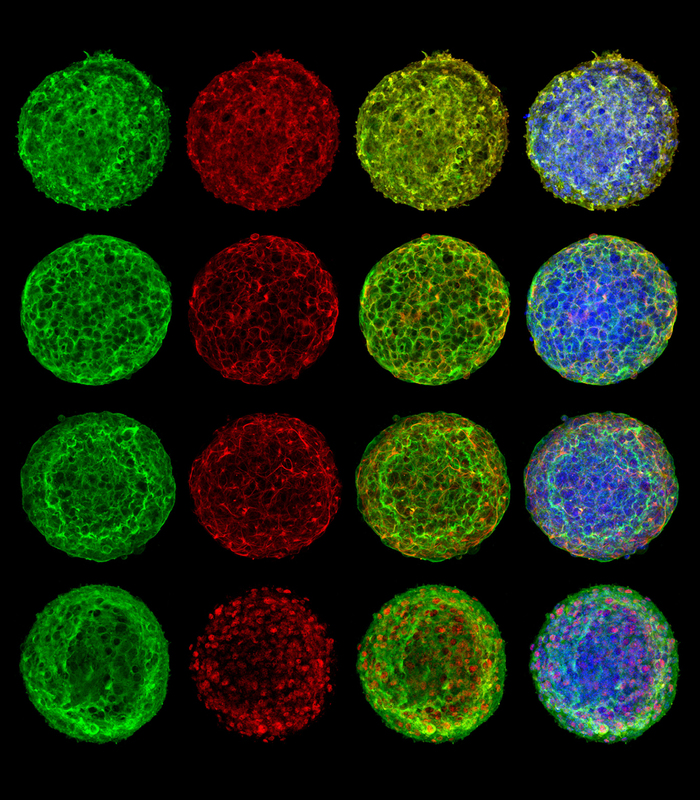 These immunomarkers confirm that gut neurospheres contain neural crest-derived cells, neurons, glia and ENS stem cells. Submitted by: Dr Alan Burns and Dr Ellen Binder. 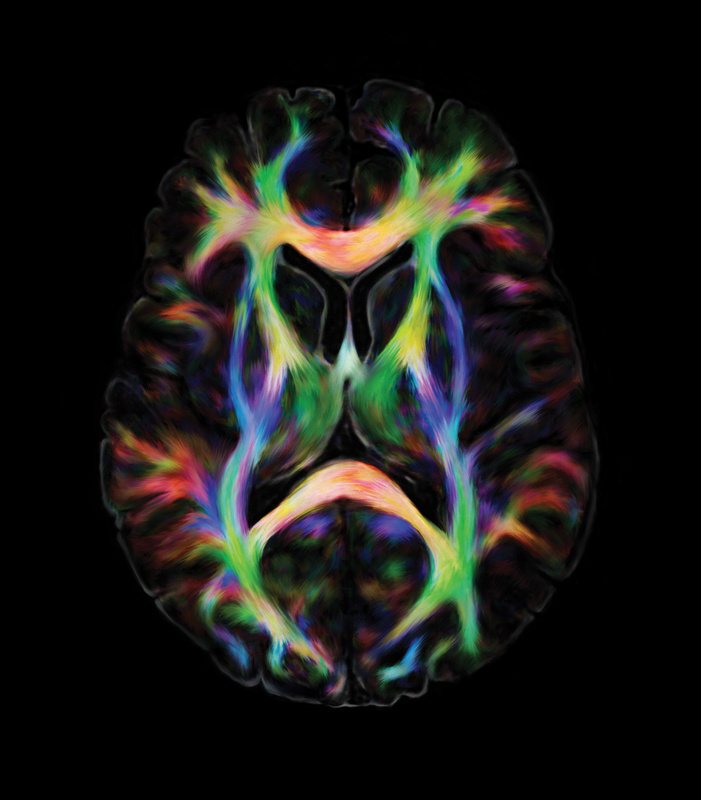 Description: Axial diffusion-weighted MRI tractography image of living human brain. Nerve fibre colour represents movement of water. Lateral diffusivity: red/orange; anterior-posterior: green; inferior-superior: blue. Acquired on Discovery MR750w 3.0T by GE Healthcare. Enhanced by Ben Crossman. Image to be used as cover of 5th edition of Neuroanatomy (Crossman and Neary; Elsevier). Copyright statement: The original image was provided to me by GE Healthcare specifically for use as the basis of an illustration for my use. The image was manipulated and enhanced by Ben Crossman and will be used as a book cover illustration by Elsevier Ltd. Elsevier own the copyright to the submitted image. I have obtained specific consent from Elsevier to submit the image for this competition and GE Healthcare are also fully supportive. Submitted by: Professor Emeritus Alan Crossman and Mr Ben Crossman. Description: This pseudo-coloured SEM micrograph shows sensillae located on the in the inner curvature of the forcipular apparatus of the House Centipede - Scutigera coleoptrata. The forciples have evolved from walking legs into pincer-like structures containing a complex venom gland and duct system; the sensillae aid in prey detection and capture. Submitted by: Mr Alexander Black and Dr Michel Dugon. Description: An oligodendrocyte (blue) extends to form myelin sheaths (green) to encase Purkinje cell axons (red) in the developing rat cerebellum. The image shows a projected confocal z-stack from a 250µm cerebellar slice where cellular elements were visualized using immunohistochemistry. Olig2 (an oligodendrocyte specific transcription factor) demarcates the oligodendrocyte nucleus shown in blue, myelin basic protein expression in the oligodendrocyte is shown in green, and neurofilaments within Purkinje cell axons are shown in red. Submitted by: Dr Janelle Pakan, Post-Doctoral Fellow, UCC, Dept of Anatomy and Neuroscience, Dr. Kieran McDermott Laboratory, Ireland. 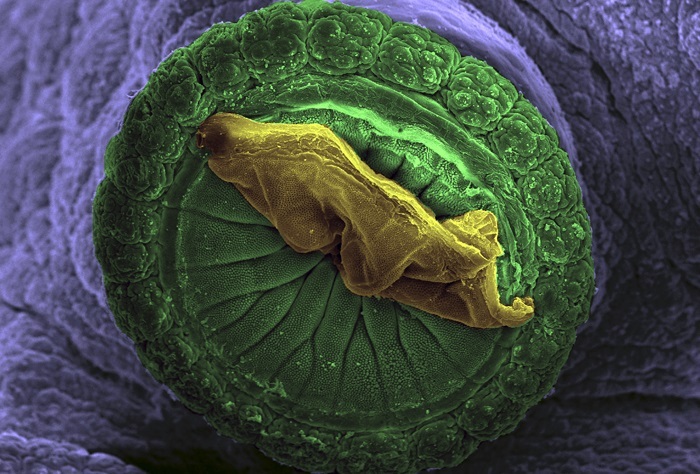 Description: SEM of a mouse middle ear mucosa. The mucosa is covered in a lawn of ciliated cells that help to clear the middle ear cavity. Red blood cells pseudocoloured in red. Submitted by: Dr Abigail Tucker, Reader in Craniofacial Development and Orthodontics, King’s College, London. Description: Image taken from a cross-section of Villanueva stained cortical bone. It shows an osteonal Haversian canal, with a Volkmans canal emanating from each side. Interestingly the osteon is undergoing mineralization (stained red) and its osteocyte lacunae and, of particular interest, their canaliculi can be clearly seen. Image was acquired using a Zeiss-Apotome Optical Sectioning system. Description: Confocal image of nestin (red) positive radial neuroepithelial cells dorsally and co-localized nestin (red) and BLBP (green) positive radial glial cells ventrally in an 40 micron transverse section of the E14 rat spinal cord. Cell nuclei are labelled with bisbenzimide (blue). Mr. Daniel Tams, University of Durham "Neurosphere"
Dr. Jon Colinson, University of Aberdeen "E16.5 paw muscle"
Description: Whole mount immunohistochemistry to visualise skeletal muscle myosin in the developing ventral pad of the E16.5 mouse paw. The beautiful complexity of the muscle arrangement is demonstrated in situ.